Last month over 1,100 participants from around the world gathered in Chicago for the largest Patient Experience Conference to date. It was an incredible week offering opportunities for sharing and connection with our community. We learned together, cried together, laughed together and even danced together. 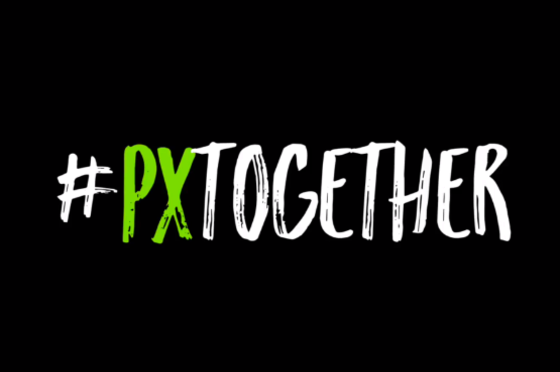 This year’s opening video and message focused around the idea of #PXTogether. You may have even seen photos on social media of people proudly wearing t-shirts with that hashtag. But what does it really mean and why is #PXTogether so significant in this movement? Being part of The Beryl Institute team for the past seven years, I’ve had the opportunity to watch this field evolve through the power of community. I remember celebrating the first official member of the Institute on September 14, 2010, and we’ve continued to celebrate each time our now more than 14,000 members made that decision to join the patient experience movement. We celebrate because membership shows they share a commitment to this work and see value in accessing content and resources to improve the experiences of their patients, families and teams. But we also celebrate because their involvement means our community can learn from them as well. Each new thought, idea, process or question shared expands the library of resources and offers new insights and opportunity to others. That is the power of #PXTogether. So, how can we ensure it’s more than a hashtag? I challenge you with a few suggestions to reinforce your commitment to this work and to the patient experience community. Share your experiences. As we continue to support the global patient experience movement and in the spirit of #PXTogether, the Institute is expanding efforts to gather and build a library of case studies on the value and impact of patient experience from settings across the continuum of care and from locations around the world. We’re looking for case studies that identify critical opportunities or address specific problems, are focused on practical and replicable steps and provide some measure of outcome and/or impact as a result. Submit a case study so other community members can learn from your efforts. Recognize the successes of your team and/or those who inspire you. At the Institute, we understand the effort it takes to change cultures, implement new strategies and build true partnerships with patients and families. In order to recognize those efforts, we will be honoring and celebrating innovation among advisors, healthcare professionals and teams through our new PX Innovation Awards program. Consider nominating yourself, your team, organization, Patient/Family Advisor or others you see doing incredible work to further the movement. Celebrate healthcare staff impacting patient experience everyday. Last week was the fifth annual PX Week. Inspired by members of the Institute community, PX Week provides a focused time for organizations to celebrate accomplishments, reenergize efforts and honor the people who impact patient experience from nurses and physicians, to support staff and executive professionals, to patients, families and communities served. The official PX Week always starts on the fourth Monday of April, but if you missed it this year, we encourage you to find a week that works with your organization’s calendar and priorities. Celebrating PX Week, whenever you choose to do it, reinforces to your staff that patient experience is a priority and their efforts are appreciated. The Institute has created a list of resources to assist you with planning a recognition program with suggestions for events you can implement and offers a list of audiences you should remember during your celebration. Spend time with those who share your passion.The true spirit of #PXTogether can perhaps be seen best when those committed to improving patient experience gather to network, share and inspire one another. Save the dates and plan to attend future Patient Experience Conferences, and, even before then, join us at one or more of our new PX Pop-up events. Dates and locations will be announced soon for these regional lunch meetings hosted by member organizations. Representing the idea of connection and sharing that has been essential to the Institute’s growth, the power of community remains strong and #PXTogether reinforces the great opportunities still ahead.